Adia Bulawa (left) and Sarina Kopf (right) are the two teen winners of the 2018 Guardians of the Galaxy Space Station Challenge. Supplies and research payloads supporting hundreds of science experiments will be on board Elon Musk's SpaceX's Dragon spacecraft in preparation for a Wednesday launch to the International Space Station (ISS). Of those important payloads, two stand out. They are led by teens and loosely inspired by the popular "Guardians of the Galaxy" comics and movies. Young scientists Sarina Kopf, 18 and Adia Bulawa, 18, won this year's inaugural Guardians of the Galaxy Space Station Challenge. The educational challenge was sponsored by the ISS U.S. National Laboratory and designed to inspire teens to think about experiments that couldn't be done in traditional Earth-based classrooms. Each project was crafted with engineering or biology in mind to match the powers of the fictional Marvel characters Rocket (a raccoon and engineer) and Groot (a tree-like superhero). Ahead of their trip to the Kennedy Space Center to watch the launch, Kopf and Bulawa caught up with CNBC Make It to talk about their projects and what it's like to have their work sent to the space station on one of Elon Musk's rockets. Adia Bulawa standing in front of a SpaceX Dragon model in 2018. If you got a cavity in space, how would you fill it? That's a question Adia Bulawa asked herself while sitting in her dentist's chair for a routine checkup. While some Earth-bound dentists might place a gel over a cavity and flash ultraviolet light over it until it hardens, Bulawa wasn't sure if the same process would work in space. Bulawa's experiment investigates how well a dental glue activated by ultraviolet light would fix a broken tooth or lost filling in microgravity. Researchers will evaluate the use of the glue by treating simulated broken teeth and testing them aboard the station. This is the second experiment that Bulawa has successfully pitched to be performed in space, but the first that will actually travel up to the ISS. 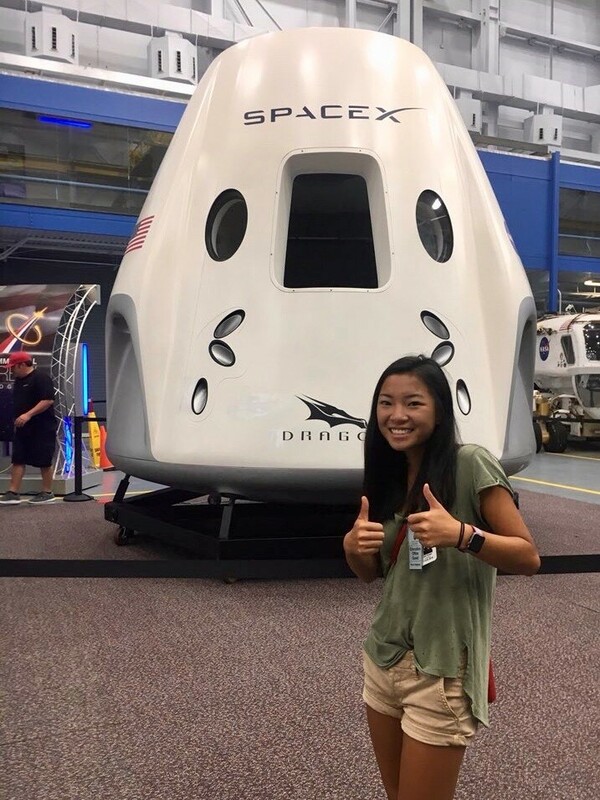 Bulawa visited space product developer NanoRacks in Houston, Texas the summer after her junior year at Greeneville High School in Tennessee to bring her project to life. Together they helped Bulawa create an apparatus that would fit in a container the size of shoebox which she says will be controlled by NanoRacks from earth. Bulawa's interest in space exploration has been fueled by this project as well as role models such as Elon Musk. Now a senior, she says she intends to pursue engineering in college. She says this project has helped her better understand the types of work that interest her most. For instance, while she's not interested in becoming an astronaut, she does enjoy tangible research that can be run on the ground. "I do think there'll be people in our generation that'll go up to Mars, but I'm more of an on-the-Earth kind of gal." Sarina Kopf, currently a freshman at Iowa's Grinnell College in Iowa, was a high school senior in Colorado when she led a team of four other students in submitting an application for the space station challenge, one that could help eliminate a major obstacle for long-term spaceflight: How to grow food in microgravity. Her team's experiment explores aeroponic farming, an alternative method for watering plants in the absence of gravity or soil. In her experiment, a watering device will mist the plants until the roots absorb the water. The lack of gravity in space, she explains, makes re-creating aeroponic farming in space challenging. Since so many ordinary processes rely on gravity, the project "changes the way you have to think about things." Kopf's project, which she hopes will produce broccoli and kale, will be in space until it returns in January 2019. Kopf is eager to have her project travel on Musk's spacecraft. "I look up to Elon Musk because he seems like the modern example of the American Dream," she says. "I appreciate the fact that he's pushing the boundaries of what we think is possible and what we even aim for. It's something I take to heart." She's also proud to have her research included on the International Space Station. "I live in rural Iowa. There's no light pollution whatsoever so we go stargazing a lot and it's really fun to see ISS pass overhead and look at that and say, 'I'm going to put something up there,'" says Kopf. "That's such an insanely indescribable feeling." This article has been updated to reflect how water will be absorbed in Team Groot's experiment and how a lack of gravity makes aeroponic farming challenging.